The documents listed below are designed to be used as a crisis management package in the event of an acute perioperative anaphylaxis. We recommend all members of your department are aware of their content and how to use each card or section. Please take the time to read the introduction and each of the cards carefully. Optimum use will occur when clinicians are well prepared and have used the resource to practise crisis management prior to an event. Please note: If you are having problems downloading or printing these documents, ensure you have the latest version of Adobe Reader installed. This is a free program for viewing and printing PDF documents. ANZAAG recommends the management documents are stored in an agreed location known to staff in operating theatres eg. with an Anaphylaxis Box or on the cardiac arrest trolley. 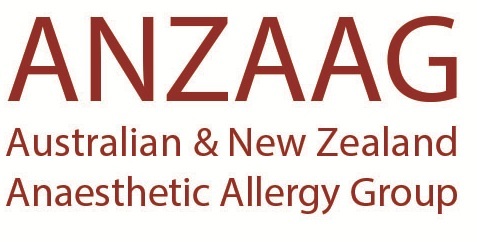 Anaphylaxis Box documents are available here .